Baby showers are such a special time for a new parent or a parent-to-be. It’s a great time to gather loved ones to celebrate the arrival of a new baby. No matter if you choose to host the shower before the baby’s arrival or after the baby’s arrival, we have plenty of fun ideas for baby shower activities, themes, planning checklists, food ideas, decorations and more. On this page, we’ve summarized the baby shower related posts on Moms & Munchkins. Simply click on the topic you are interested in and it will open in a new window for you. As always, we’re always open to your suggestions so feel free to contact us if you’d like a particular baby shower question answered or need ideas for a special theme. Bun In The Oven: This is a great theme for all ages and genders because it’s filled with delicious bakery goodness! Cravings Baby Shower: Even if you didn’t crave pickles and ice cream when you were pregnant, you’re going to love these baby shower ideas surrounding all of the mommy-to-be’s favorite foods. Dr. Seuss Baby Shower: With so many crazy characters and adventures, it’s easy to plan a fun Dr. Seuss-themed party! Ducky Theme: Not only are ducky baby shower themes adorable but they are perfect for gender neutral parties as well. Elephant Baby Shower: The photos may be a show a delicate pink theme but these ideas can easily be modified for a gender neutral or a baby boy shower. Gender Reveal Party Ideas: Did you find out the gender of your baby before he or she was born? Here are some fun ways to plan a party to reveal the exciting news. Little Man Theme: Grab your monocle, tie and mustache, it’s time to plan a Little Man Party! This theme is perfect for both baby showers and first birthdays. Modern Family Theme: I absolutely LOVE the TV show Modern Family! So much so that I planned an entire baby shower theme around the show! Nursery Rhyme Baby Shower: One, Two, You’ve Got Planning To Do! This cute Nursery Rhyme Baby Shower post is filled with ideas for invitations, decorations, food ideas that will make you chuckle and free printable games! Paris Baby Shower: Ooh-la-la! This Paris Baby Shower post is full of fun ideas for food, decor, favors, activities and more! Ready to Pop Theme: Did you feel like you were going to pop around the end of your pregnancy? I sure did! Here are some fun ideas for planning a Ready to Pop baby shower with ideas for food, free printable games and more! Rock-A-Bye Baby Shower: Trade in the cute pink & blue decorations for music, tattoos and motorcycles in this not-to-typical baby shower theme! Sugar & Spice Theme: Sugar & Spice and everything nice – that’s what this shower is made of! Sweet Dreams Theme: Fluffy clouds, twinkling lights and a table full of desserts. Sounds like the perfect party theme to me! Sweet Pea Theme: So many expecting parents refer to their unborn child as sweet pea. It’s such a loving term for referring to your child and it makes an adorable baby shower theme! 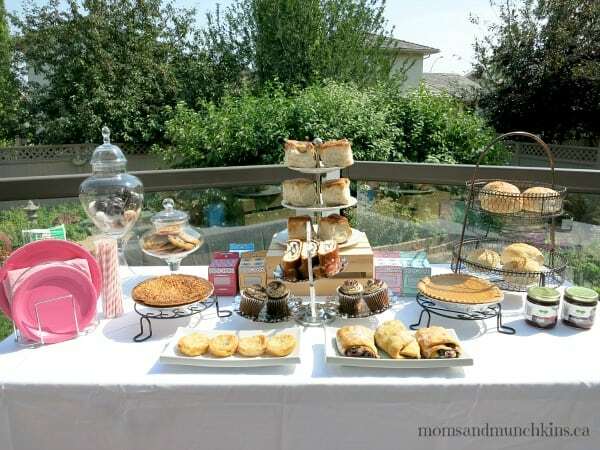 Tweetie Pie: A beautiful garden setting and a pie buffet, it doesn’t get much better than this! A totally “tweet” theme for your mommy-to-be. We have many new ideas for baby shower activities coming up soon so check back often for updates! Stay updated on the latest ideas by following us on Facebook, Twitter, Pinterest and Bloglovin’.